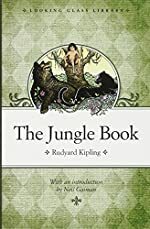 The Jungle Book by Rudyard Kipling. A Looking Glass Library Book. Review: Imagine living in the jungle, where the thick trees tower above your head and the green undergrowth stretches forever across the forest floor. Imagine growing up with wolves, and despite their rough play and superior attitudes, you love them as your family. Despite how many friends you have, danger is lurking behind every corner and some will not rest until they find you. This is the life of young Mowgli in Ruyard Kipling's The Jungle Book. When you read this book you will join the many jungle adventures of Mowgli and his many friends. An important thing to know is that The Jungle Book is a combination of the original The Jungle Book, The Second Jungle Book and the short story "Rikki-Tikki-Tavi". The first stories are about young Mowgli, who is a boy who is abandoned by his parents as they fled from the fierce tiger, Shere Khan. A kind wolf family from the Seeonee wolf pack, Baloo (a bear who teaches the law to the cubs of the pack) and Bagheera (a black panther) decide to take him in. By doing so, they take Mowgli out of the way of Shere Khan, who is set out to kill Mowgli. The next few stories are about his time with men when he was cast out of the pack. Later, he returns to the jungle and is eventually faced with the decision of staying in the jungle or joining men. Throughout his life, he faces many adversities and his arch nemesis, Shere Khan. With the help of the pack, Baloo, Bagheera, and an old snake named Kaa, he learns the ways of the jungle and where he truly belongs. After reading this collection of stories, I believe that the new edition of The Jungle Book is a good read. Mowgli is an interesting character to follow at first because of his curiosity and love of adventure. Once Mowgli grows up and gains power, he becomes more dislikable because of his arrogant manner and his belief that he is superior to all in the jungle. As for the dialogue, it is a little choppy, especially being part old English and part not. It also may be because most of the characters refer to themselves in third person and that Mowgli and the animals do not have good grammar. The plot of most of Mowgli's stories is interesting and takes you on exciting adventures. Most of them start slow, but then grow increasingly exciting as they go on. Because of this, the story goes at a medium pace. Despite this, the plots are well described and so are the different characters that are involved in them. Being that the plot changes every chapter, I was never truly hooked into the book. I rate this book a 7 out of 10 because parts of it were interesting, but I never was drawn into it. To conclude, The Jungle Book is a good novel to read for all middle school students. Review written by Shannon (7th grade student). We would like to thank Random House for providing a copy of The Jungle Book for this review. Have you read The Jungle Book? How would you rate it?